Saudi Arabia, the United Arab Emirates, Bahrain and non-Gulf Cooperation Council (GCC) member Egypt cut diplomatic, transport and trade ties with Qatar in June 2017, accusing it of supporting terrorism and their regional foe Shia Muslim Iran -- something Doha denies. 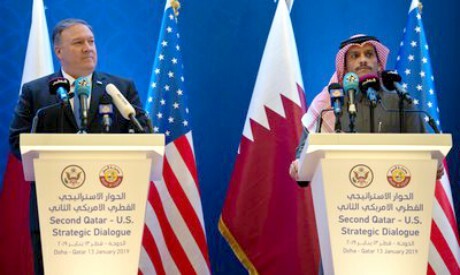 "When we have a common challenge, disputes between countries with shared objectives are never helpful," Pompeo, who is on an eight-day tour of the Middle East, told a news conference in the Qatari capital Doha. Pompeo later told reporters that he had brought up the rift with officials in Bahrain, Egypt and the UAE. "It's ... not at all clear that the rift is any closer to being resolved today than it was yesterday and I regret that," he said. Pompeo has used the regional tour, which included stops in Abu Dhabi and Cairo, to shore up support for the US troop withdrawal from Syria. He will head next to the Saudi capital Riyadh, where he said the United States would ensure there is "full and complete" accountability on the murder of Jamal Khashoggi US-based Washington Post journalist from Saudi Arabia. "We will continue to talk about that and make sure we have all the facts so that they are held accountable certainly by the Saudis but by the US as well where appropriate," Pompeo told the news conference.